The Ministry of Social Cohesion’s Department of Labour has taken its consultation exercise for the development of a National Child Labour Policy to Region Five, Mahaica-Berbice to get input from the private sector, religious groups, the RDC and representatives of other organisations. 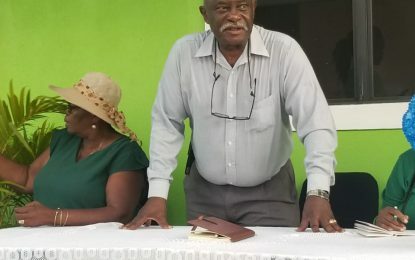 Chief Labour Officer Charles Ogle told the participants that following a rapid assessment it was determined that child labour does exist in Guyana. Therefore the Ministry of Social Cohesion is ensuring all necessary stakeholders are involved in the drafting of a comprehensive strategy designed to combat this issue. During the May 24 consultation at the RDC’s Boardroom in New Amsterdam, the participants were educated on what constitutes child labour and the strides being taken to curb same. While Guyana does not have a specific articulated policy on child labour, several related policies and outdated laws have been amended and updated in sectors involving child labour. A MICS study between UNICEF and the Bureau of Statistics revealed that approximately 20.1 percent of Guyanese ages five to seventeen are engaged in some form of child labour. The Agriculture sector has the highest number of children working illegally while the most vulnerable are the children residing in the hinterland, recruited to work in the mines or trafficked for sexual exploitation. Workshops of this nature will be held throughout the 10 administrative Regions across Guyana in order for the shed much-needed light on local child labour and to garner sufficient stakeholder input to design craft a comprehensive national policy. Images courtesy of Tanuja Raikha. Participants at the Ministry of Social Cohesion’s consultation exercise.